Eat Fish, Drink Beer, Live Longer! Established in 1976, this month’s restaurant is one of the original eateries that helped put Old Town Alexandria on the map and, is for me, a trip down memory lane. 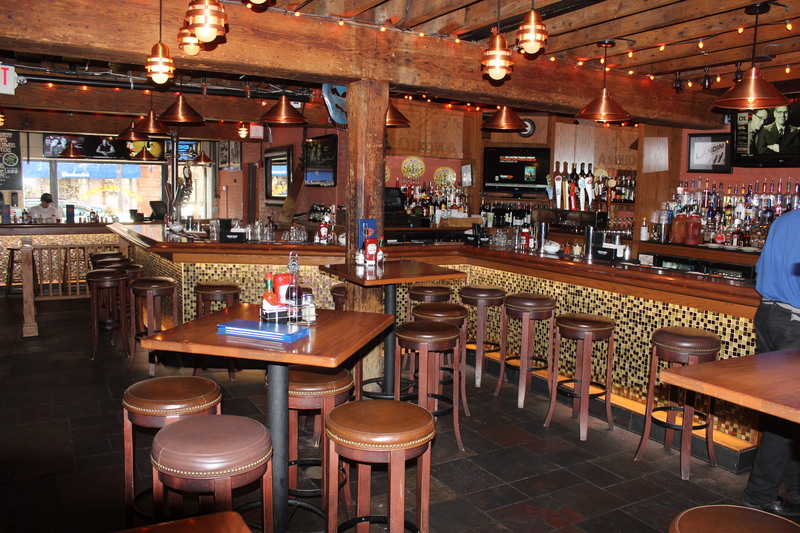 When I came to Old Town in 1977 the Fish Market became my go-to bar and restaurant. We would gather at the then, Brass Bar, for beers in the afternoon. It was the gathering place for many of the locals back then…businesspersons, shopkeepers and artists from the Torpedo Factory. Back then, the restaurant reached all the way to Union Street at the Raw Bar. There were four bars on the main floor with a few more upstairs. Times have changed and the place has changed but the atmosphere and food quality is just as good as back then and the menu has been upgraded to include very diverse offerings. Then, as now, the Fish Market is still putting Old Town on the map. About 6 years ago, Franco Landini and his son Noe bought the restaurant from the estate of Mr. Ray (Giovannoni) who founded the restaurant. The Landini’s immediately gutted the place, took out a bar, and rebuilt the entire place including a new and modern kitchen. Cory Fey, now the Corporate Executive Chef, was brought in to run the kitchen and he added more items to the list of fried, broiled or steamed fish choices. Today, the restaurant offers a raw bar, soups and chowders, starters and salads, sandwiches, burgers & tacos, grilled platters, fried platters, specialties, nautical pastas, sides and a kid’s menu. The menu is very extensive but many favorites have remained over the years. First and foremost, the Fish Market has always been noted for its 32-ounce schooner of beer. This practice still exists and has many faithful followers. 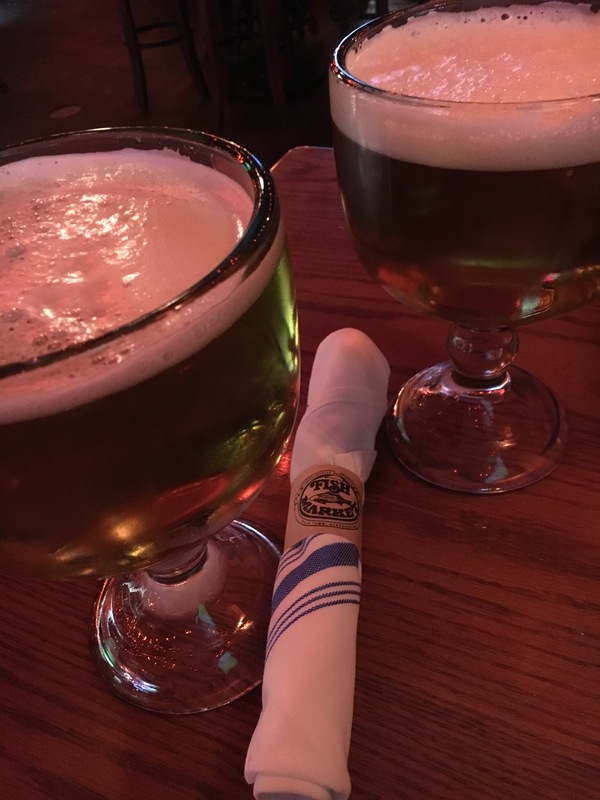 The schooners are ice cold as is the beer and if you are thirsty, it hits the spot! There are also many craft beers available , a special cocktail list and a very extensive wine list. You can find just about anything you want here. From the soups category you have your choice of the famous Fish Market clam chowder, seafood stew and crab soup. The clam chowder has always been a staple and the seafood stew was added to the menu back in the late 70’s…this place has history. 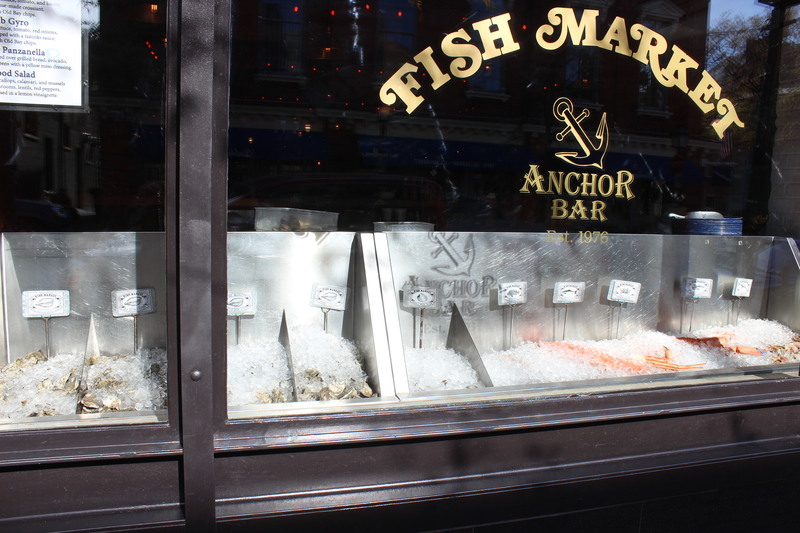 The raw bar is located at the front of the restaurant and has seats and a picture window view of strollers on King Street. The Fish Market has partnered with folks on the bay that produce oysters, thus they are able to harvest their own. They also buy fresh from other oyster operations on the bay so every oyster served is local. As good as these oysters are, my all time favorite is the steamed shrimp. Good size, plump, firm shrimp steamed in the best concoction of spice and butter ever. They are delicious. Sandwiches at the Fish Market range from a jumbo crab cake, grilled or blackened Mahi Mahi, lobster rolls and the original filet-o-fish. Burgers and tacos range from the famous Boat Burger and Old Town burger to Jaco tacos and Drunken cod tacos. Grilled platters include the Admirals, Skippers, Seasonal catch, Surf and Turf and Crab Norfolk. Roasted red potatoes and asparagus accompany each of these platters. The fried platters begin with the Captains and Fisherman’s and Fried Shrimp (my all time favorite) to Fish N’ Chips and Fried oysters. The menu continues with house specialties including Fresh Whole Maine Lobster, Alaskan Snow Crab Legs, Jumbo Crab Cakes, Fried Fish Pontchartrain, Sea Scallops, Seafood Jambalaya and Bacon-Onion Crusted Salmon. They also offer 7 pasta dishes ranging from Lobster Linguini, Linguini and Clams and Combination Seafood to Lobster Mac. Chicken N’ Cream was always one of my favorites. On the particular evening we were there I had the Admirals Platter, which at first didn’t look like much, but I couldn’t finish it. 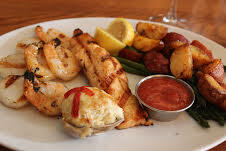 Perfectly grilled scallops, shrimp with a sizable piece of Salmon and Crab Imperial. Along with the roasted red potatoes and asparagus, it was more than enough. The fried platters are, in my opinion, a little over cooked except for the butterflied shrimp…that is always wonderful. The pasta dishes have always been tasty and served with plenty of whatever you choose and the portions are hefty. My dining companion ordered the Seafood Cobb salad. This salad is served with plenty of crab meat (not jumbo lump) and steamed popcorn shrimp. Served on a bed of romaine with the usual cucumbers, tomatoes, hard boiled eggs and blue cheese crumbles, it lacked bacon but she detected green olives, which was a surprise. I wouldn’t have welcomed that ingredient but she liked it. The salad is definitely a meal in itself. The restaurant is bare top tables but has added a cloth napkin wrapped around the silverware, which makes for a little more panache. The Fish Market is a casual restaurant but is also a beautiful build out. There are two floors for dining with a large bar on each floor. The whole restaurant seats over 400 so there is always room for more. One of the best places to dine, weather permitting, is one of the three tables on the balcony overlooking King Street. The Fish Market was the perfect place to dine and feature this month since our underlying theme for the December issue is “Home for the Holidays”. Treat yourself to a lunch break while shopping or a relaxing dinner in the dining room. Don’t forget about the Anchor Bar if you like sports – your game will be playing on one of the several flat screens that surround the room.